As part of a new five (5) year agreement, the Scotiabank Blue Nose Marathon has named BOYNECLARKE LLP the title sponsor of the brand new 15KM event, to be known as the BOYNECLARKE LLP 15KM. Since the firm was founded in 1972, BOYNECLARKE LLP has grown to become one of Atlantic Canada’s largest full-service law firms. They pride themselves on their commitment to the community and are thrilled to be a title sponsor of one of the largest community events in Nova Scotia. 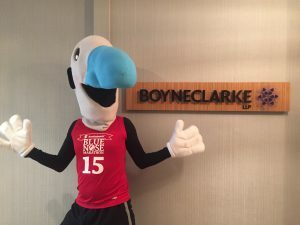 The BOYNECLARKE LLP 15KM, which celebrates the 15th annual Scotiabank Blue Nose Marathon, is a new addition to the roster of races at the event. This route will take participants on journey through the streets of both Halifax and Dartmouth – with approximately 9KM of the course occurring in Dartmouth. Organizers expect about 800 people to participate. Participants interested in registering for the BOYNECLARKE LLP 15KM can visit bluenosemarathon.com to register. Known as ‘the people’s marathon’, the Scotiabank Blue Nose Marathon welcomes all ages, abilities and fitness levels to the start line. With the help of more than 1,400 volunteers, the event hosts seven fitness events (Lifemark 5KM, GoodLife Fitness 10KM, BOYNECLARKE LLP 15KM, Blue Nose Half Marathon, Scotiabank Full Marathon, Killam Marathon Team Relay and the Doctors Nova Scotia Youth Run-2KM and 4KM), and the largest Active Living Expo in Atlantic Canada. Through the Scotiabank Charity Challenge, over 70 local charities raise more than half a million dollars annually. The event takes place annually during the Victoria Day weekend (May 18-20, 2018) in Halifax and expects to welcome 13,000 participants in 2018.